On the sidelines of the Human Rights Council / 37th session at the UN headquarters in Geneva, Prof. Alfred de Zayas, United Nations indipendent expert with a mandate on the “Promotion of a Democratic and Equitable International Order”, organized a side event on “Principles of International Order”. 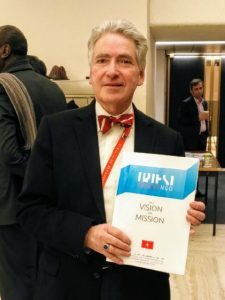 Prof. Alfred De Zayas invited representatives of the countries of the Balkan/Danubian basin to permanent missions in Geneva and experts in international law to the United Nations. At the center of the report was the failure to comply with the Paris Peace Treaty of 10 February 1947, in particular the failure to establish the Free Territory of Trieste and the Italian nationalization of the international free port of Trieste, whose management, beyond the political proclamations of the director Zeno D’Agostino and the Italian political establishment, carries on without Annex VIII being applied. Triest NGO further questioned the representatives of the international community about the unresolved issues of goods abandoned by the citizens of Zone B and their still frozen capitals in European banks, and, in addition, about the problem of the provision of US funding for the Free Territory of Trieste that are still being paid into Italian bank accounts and managed by Rome (ERP Plans / Marshall – Agreement on the use of counterpart funds from the United States economic aid to Trieste February 11, 1955). Triest NGO pointed out to the delegates of the international community the boycott enacted by the current illegitimate administrators of our Free Zones chiefly responsible of the violation of the Right to Development for the citizens of Trieste, in primis (UN Resolution A / RES / 41/128 – December 4, 1986). Furthermore, in its speech, Triest NGO reminded the participants about the continued failure to apply the Citizenship of the Free Territory of Trieste to those entitled to it, as proclaimed by the Treaty of Peace, a compliance failure that has been notified to the OHCHR Registry Office a year ago. In this same spirit legal action will also be initiated by Triest NGO at an International Court of Justice. In the report’s conclusion, Triest NGO, in order to obtain a solid legal basis for its action, urged the representatives of the international community to raise a formal protest note against Italy, Slovenia and Croatia at the international headquarters, responsible for our territory. The participants followed with interest the question of Trieste exposed during the event and Prof. Alfred De Zayas described the intervention carried out by Triest NGO as “particularly meritorious”.